Phalaenopsis orchid is a super popular orchid because of its big, colorful and long-lasting flowers. Some of them are fragrant and some of them are miniature or compact. Its growing requirements are quite simple and they can live comfortably at home with you as long as you provide some tender-loving care. (Don’t get carried away; they don’t like you like that.) 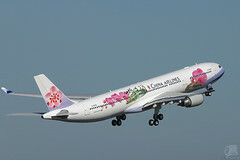 People also love them because they grow relatively quickly and could flower up to twice or more per year. They require more patience than your typical garden plants that flower in a few weeks, but for orchids, they’re pretty fast. 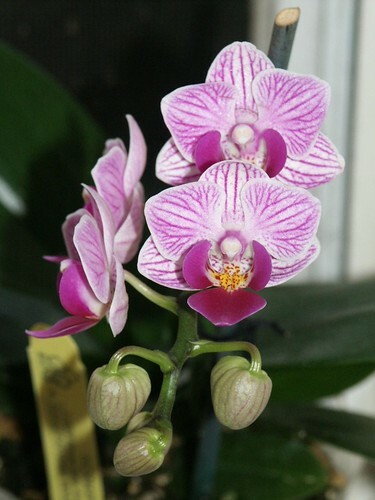 Flower spikes tend to re-flower if you cut them back to an old node, so your Phalaenopsis can brighten up your indoors for several seasons. They can really be a centre piece of a room, adding a touch of exotic elegance. They are well-worth the investment, especially if they flower more than once. Australia. 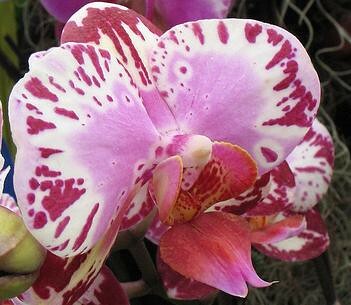 But chances are that the moth orchid you have at home was imported from Taiwan, which has quite a successful orchid industry. You can see that even China Airlines (an airline from Taiwan, not from mainland China) have moth orchids on their planes. in low to mid 60s (16-20 °C). The day and night temperature difference is essential to set flower spikes, so the constant temperature typical in office buildings does not work for them. And because these orchids don’t have water storage organs, they like to be kept lightly moist at all times (but not drowning in water either!). Even though their light requirement is low, they do not do well in dark rooms. The best indoor place for them is by the window with morning sun or indirect sun all day. American Orchid Society provides a good one-page culture sheet on Phalaenopsis, so you can print one out as a reference. 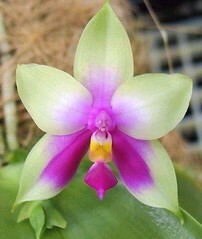 the Phalaenopsis bellina with a purple center that fades into green petals. The only color you will not find is blue. Beware when you mail order “blue orchids” from vendors who claim that they have them (even if they show a photograph); in reality, they are simply purple or lavender colored orchids. Nowadays the trendy moth orchids are the harlequin Phalaenopsis. They either have dark maroon blotches, marbled patterns, fringed edges or any combination of these.